The Folly is a stone tower, 16 feet square and 80 feet high, standing on Callow Hill, near Craven Arms in South Shropshire. It is a Grade II listed building and a much loved local landmark. Benjamin Flounders was a man of remarkable energy and wide interests. He built Flounders Folly in 1838, largely from local stone. 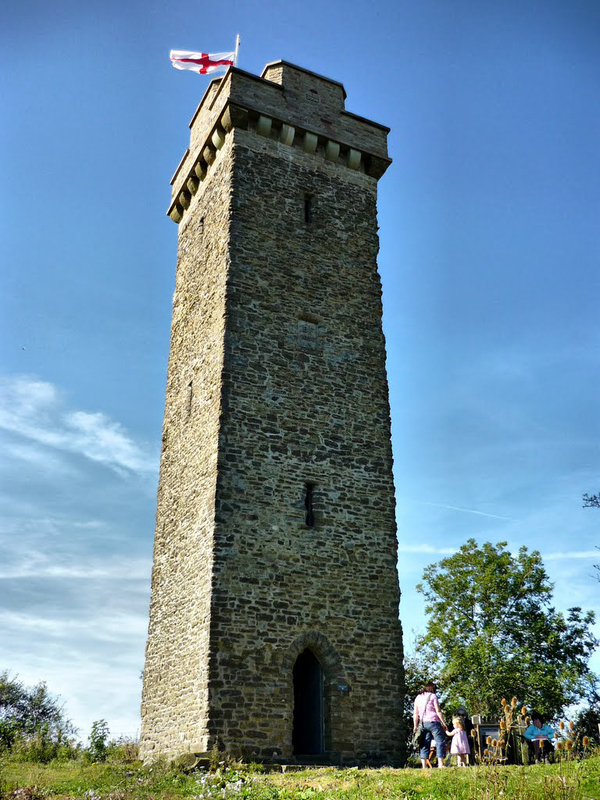 Flounders’ Folly can be found by following a waymarked trail from the Discovery Centre in Craven Arms. There are a number of walks on public paths that can take in the Folly. Please help us preserve and maintain Flounders' Folly for future generations. You can find how to donate here. How to get to the folly...Off the A49 near Craven Arms, on the road from Lower Dinchope to Westhope. Below is the 2019 opening schedule for Flounders’ Folly, the landmark stone tower standing 80 feet above Callow Hill, near Craven Arms, South Shropshire. The Folly is visible for miles around and provides visitors with spectacular views of countryside near and far. Opening dates and times are provisional and depend on the weather. Check back on this website nearer the time to ensure it will be open, or follow Flounders Folly on Facebook or @Flounders_Folly on Twitter. Built in 1838 by Benjamin Flounders (hence the name), the Folly fell into disrepair in the 20th century but was restored in 2004-5 by the Flounders’ Folly Trust. It is now open to the public one day each month so people can climb to the viewing platform at the top of the 78 stairs and enjoy the wonderful views of the Malverns, the Black Mountains, Cader Idris and much much more. Specially commissioned illustrations that run round the viewing platform enable visitors to work out exactly what landmarks they are looking at in the landscape. The footpath to the Folly from the small parking area off the lane between Lower Dinchope and Westhope is open every day, year-round, so come and have a look – there are great views on the walk up and from the foot of the tower! A Cross of St George flag will be flying from the Folly when it is open. As the Folly is stewarded by volunteers, opening cannot be absolutely guaranteed, particularly if the weather is really severe. The best place to park is at the foot of Callow Hill on the road from Lower Dinchope to Westhope, SO 457854, from where there is a footpath to the Folly.